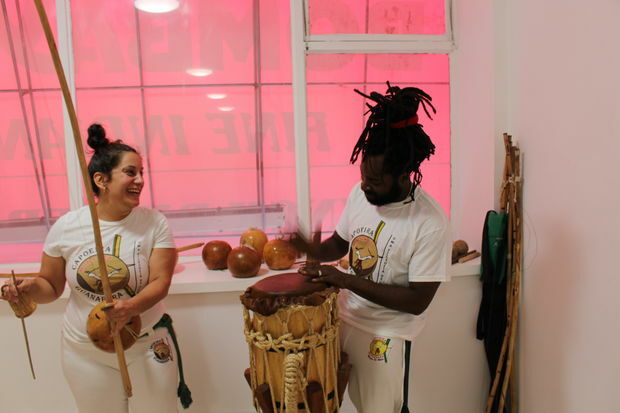 Manouela "Mudança" Koudounis and her fellow capoeira instructor Carl "Anun" Garrick, jam on traditional instruments inside the new Capoeira Fit Brooklyn studio at 525 Nostrand Ave. in Bed-Stuy. BEDFORD-STUYVESANT — A studio teaching the Afro-Brazilian martial art of capoeira is giving Brooklynites a new venue to move, dance, and get in shape in Bed-Stuy. Capoeira Fit Brooklyn opened July 1 at 525 Nostrand Ave. between Herkimer Street and Atlantic Avenue, and offers classes in capoeira as well as a full schedule of yoga classes and karate lessons for kids, according to studio owner Manouela Koudounis. Koudanis, who has a day job in finance, has been teaching capoeira for about five years, and until now has been renting out space in dance studios and public-school gyms. But now, with a more permanent space, she said she’s looking forward to growing her studio by bringing in like-minded yoga teachers and a karate sensei to fill out programming at the new space. Capoeira grew out of slave communities in Brazil, where practitioners fused combat skills with dance and music in order to hide their training from slave masters, according to Manouela Koudounis, the studio’s owner. In capoeira, the movements are synched up to music, and two “capoeiristas” square off in what practitioners of the martial art refer to as a “game,” which appeals to people who might want to get in shape and learn how to use their body in new ways but are turned off by more high-contact martial art forms, Koudounis said. The classes offer a full-body workout, with cardio and strength training to help round out the exercise, Koudounis said. Beginner classes are an hour and a half, while the all-levels classes are two hours. Koudounis is offering a discounted $50 monthlong membership for people interested in trying their hand (and the rest of their body) at capoeira, and for continuing students, membership prices vary depending on the number of classes per month. For more information on scheduling and membership prices, see the studio’s website.